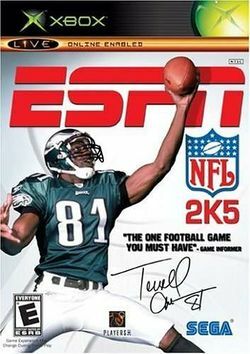 ESPN NFL 2K5 is an American football video game developed by Visual Concepts and published by 2K Sports and Sega. It is a part of the NFL 2K series. The game was originally released on July 20, 2004, for both the PlayStation 2 and Xbox video game consoles. The game features a franchise mode with a SportsCenter feature hosted by Chris Berman. He outlines the games of the current week with his co-host Trey Wingo who talks about the latest injuries and free agent deals and trades during the season. Mel Kiper hosts the draft portion of the segment while Suzy Kolber reports from the sidelines There is also weekly preparation for the coming week which allows the player to make decisions on training and preparation. The player can also create his or her own team deciding the team logos (over 10 are available), team name, the teams city, the teams stadium look and build, jerseys and how good the team is. It also has a feature called first-person football, which gives the player the experience on the field looking from the eyes of the players. There is also the traditional create-a-player mode. This page was last edited on 3 April 2016, at 21:13.